Almost two years ago I got married. It was a beautiful day in May. 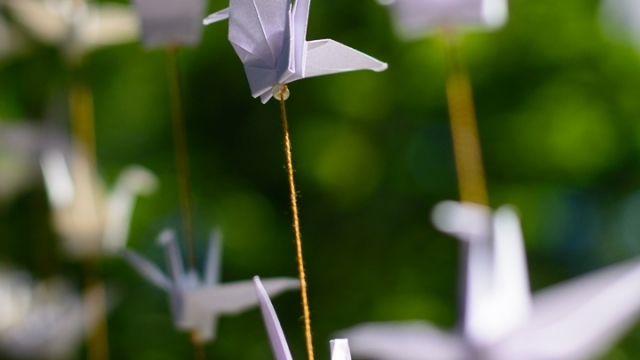 I knew it from the start that white origami paper cranes will be a must. I also knew that I preferred the wedding to be outside or in a tent as I love nature so much, and being in the open air will make it be more friendly and not formal. After a lot of searching, planning, and replanning and changing my mind a million times, we find a beautiful place, a terrace, a quiet one, even if it was close to the city center. We had only a few quests, family, and close friends. This is what we both wanted. We don’t see the appeal of big weddings where you have to invite relatives you haven’t see in years and people you don’t really want to be there, but they should because that’s the protocol. I like to believe that a wedding is the celebration of the sacred connection made between the bride and the husband, and it’s the supreme act of love between the two of them. After all, we vow that we will love forever and ever. 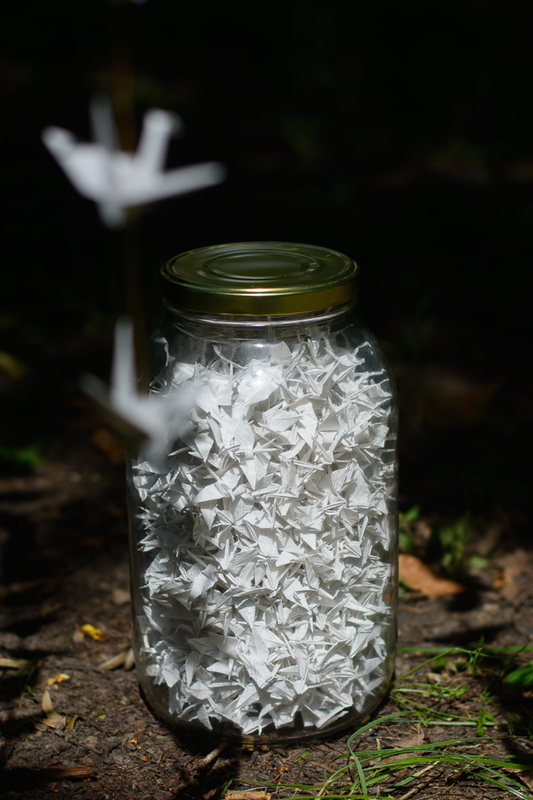 So why were those white origami paper cranes so important to me? 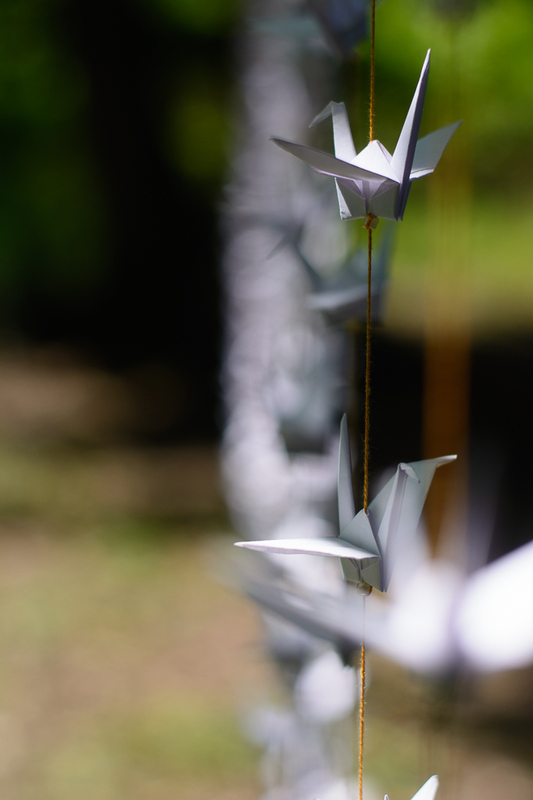 From the day I learn about the one thousand origami cranes legend I fell in love with it. 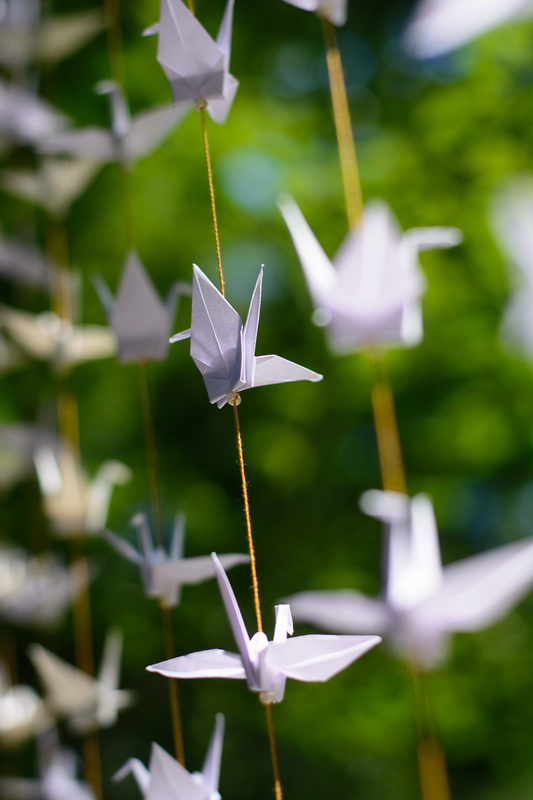 The sad story of Sadako Sasaki, the Japanese girl, who was only 2 years old when the atomic bombing of Hiroshima happened, and who after years spent in the hospital because of the radiation, found hope in the legend of the 1000 cranes. 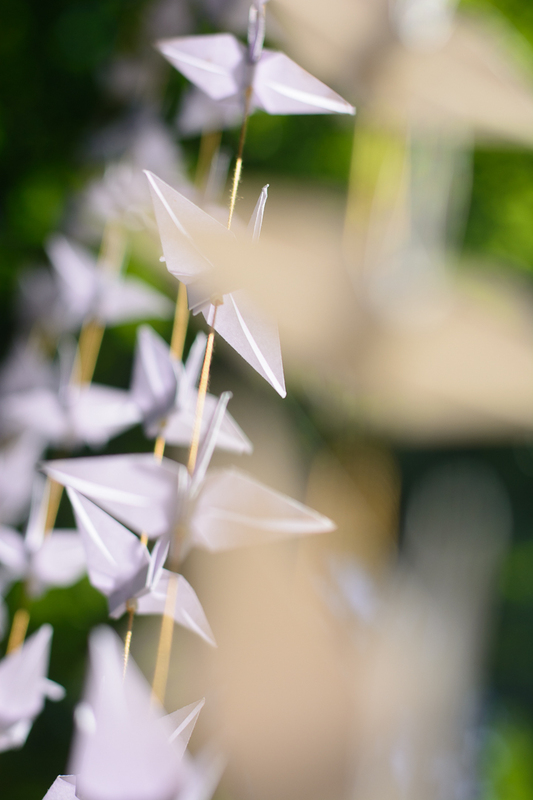 She was 12 years old when she decided she will fold the cranes so her wish of getting well will come true. 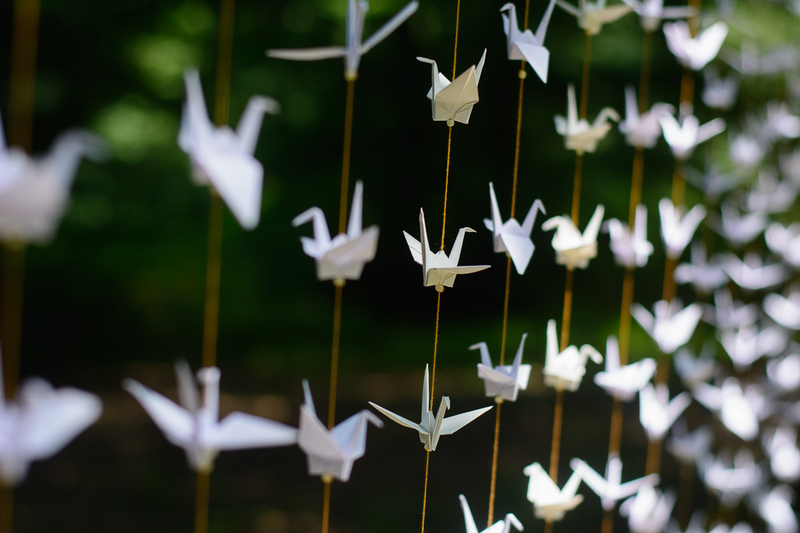 She did not succeed to fold all the cranes, as she died of leukemia after folding 644 origami paper cranes. In her honor, her classmates finished the rest of the cranes. 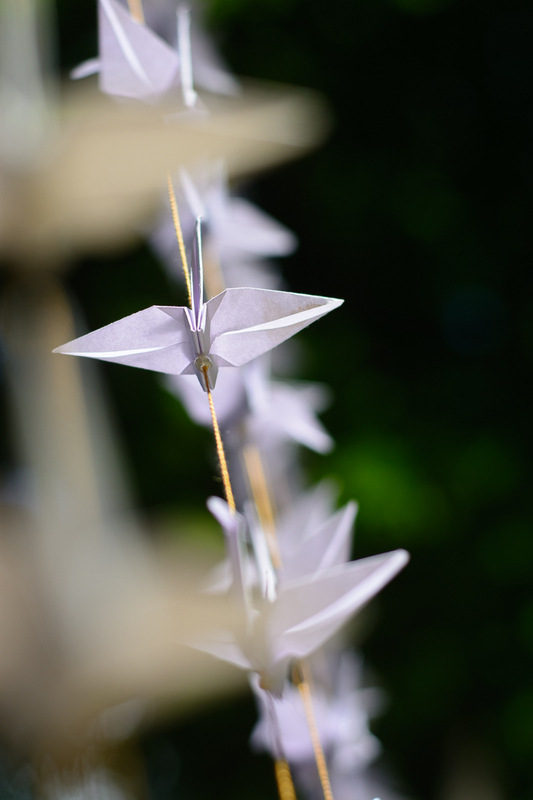 There is a statue of Sadako holding a crane in Hiroshima Peace Park, and every year people leave cranes at the statue in memory of the departed spirits of their ancestors. 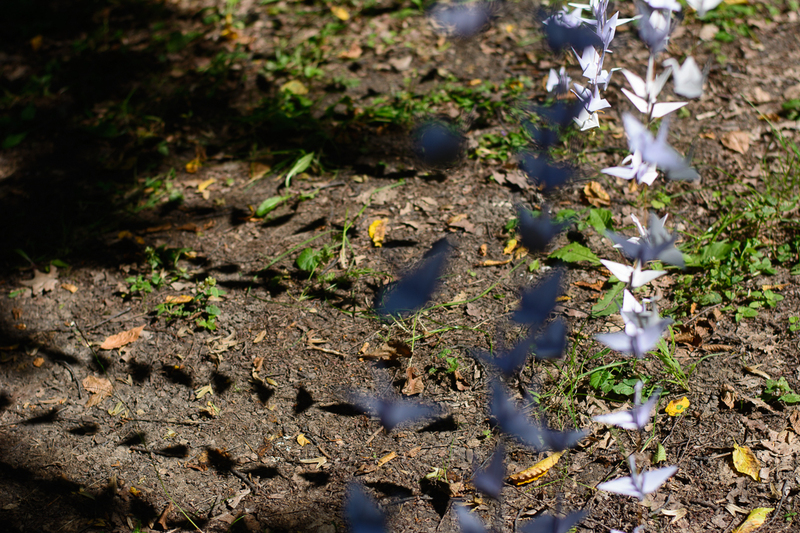 I folded 1000 cranes in her memory as well. I haven’t seen her statue or when to Japan yet, but one day I will. 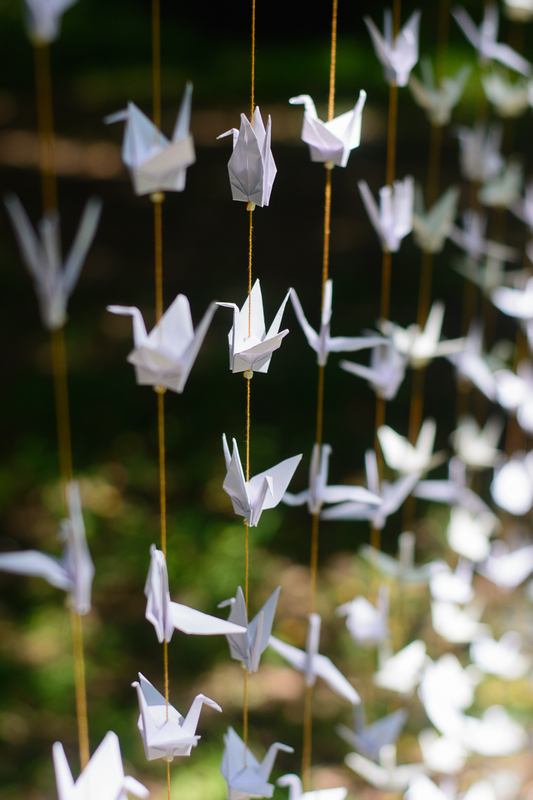 I told my husband, boyfriend, at the time, the story of Sadako Sasaki, and he decided to fold and give one crane at every date we had. And if we were to have 1000 date he will ask me a question I will not refuse. 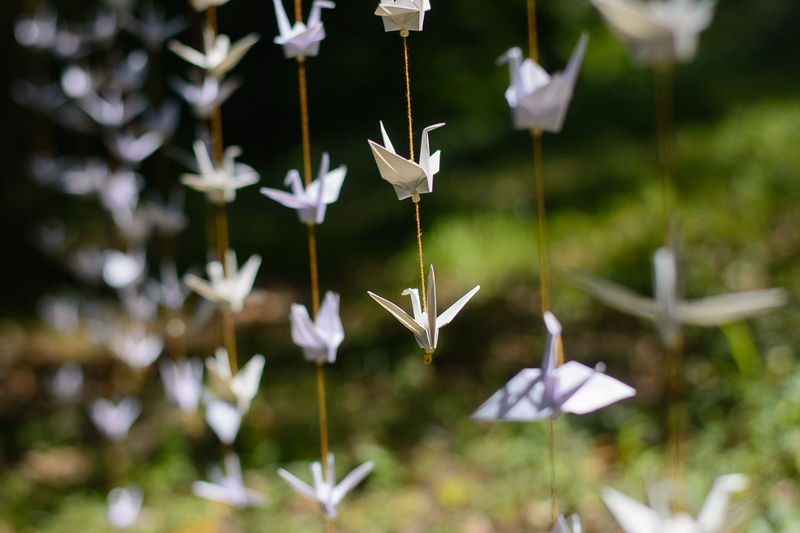 He folded about 20 or 30 cranes before he gave up, but we did have 1000 cranes on our wedding table. They were all one on top of each other in this jar. I used the same paper as the one for the bigger one. I did not trouble with origami paper for this project, I just used some block notes paper. The paper size for the small ones was 5 cm and the final dimension is about 2.5 cm. The paper for the bigger ones was 10 cm. And on top of the jar was Beauty and the Beast the Lego Brick Heads models. Beauty and the Beast is one of my favorite stories since I was a little girl. I like Disney animation a bit more than the movie, but I will rewatch the movie once in a while because it has some new songs on it. We also had origami paper cranes garlands that were laid down on the long table where we all sat down at. Unfortunately, I could not found a good photo of them to show you how they were, but it was pretty. I did want them to be as a backdrop, as that was the intended design and idea, but then the waitress will have had a difficult time serving us, and I decided that on the table will be just fine. We also had soap bubbles, and as I later learned, soup bubbles are evil. I tried to catch one of them and hit the wine glass which stained some of the cranes. But the tradition says that broken glass on the wedding day brings luck. So we should be just fine. So, after more than a year from the wedding, I was finally able to take them outside, to a close forest and photograph them, as the original concept was. 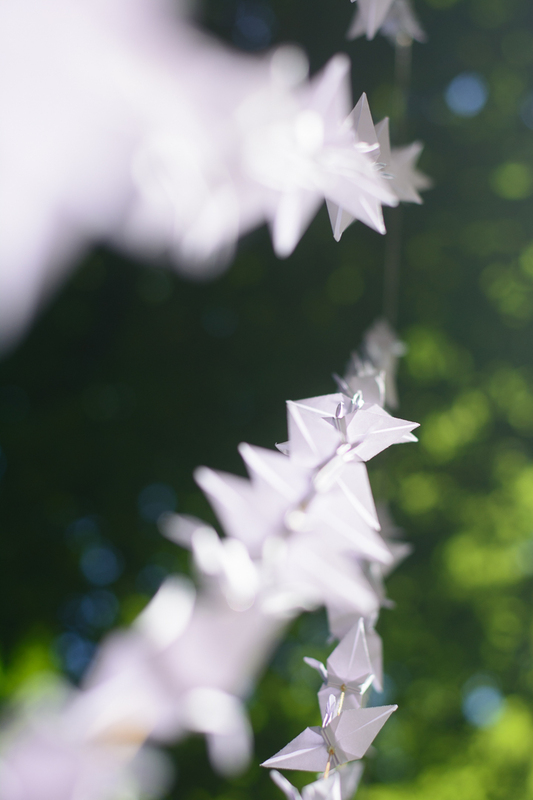 Here is my handmade Origami Wedding White Cranes Garlands Backdrop in all its glory. They were all hanged on one string tied between two trees. It was a bit of struggle to untangle them, as I did not store them very well for the trip. At home, I had them all hanged in tree points from a hanger, so there were not too many sets in one place. But for the trip, I put them all in a paper bag and hoped for the best. It wasn’t a horrible disaster, but I did have a bit of work to do. You can see how majestic they look like when they are beautifully arranged and how they can make an amazing wedding backdrop. 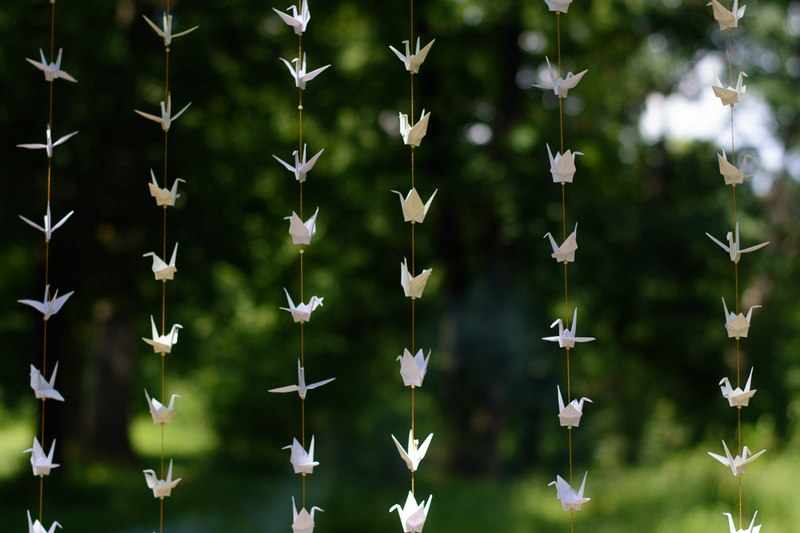 All you need to do is creating some strings of cranes that later will be hanged on another string tied between to trees or posts. 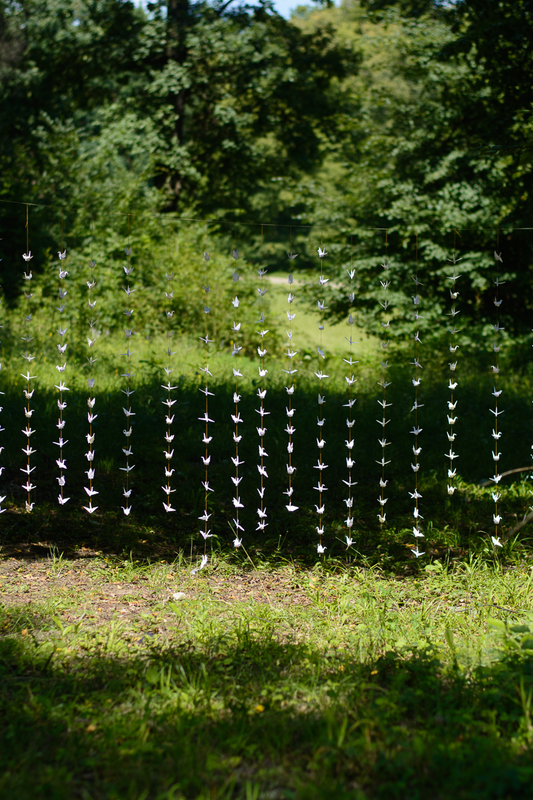 You could also hang the strings directly on the branches of the trees and so they will be at different lengths and spaces, and you will have some depth in your photos. Another idea that I had was if we were to have the wedding in a tent, it was to hang them from the ceiling. so when you look up, instead of stars you would see all those cranes. In those photos, I am showing only the first idea as I think it’s the easiest to create and the most versatile. I’m so glad I took them in nature to really allow them to shine, even if some of them are a bit overexposed, they still look amazing. I could not quite capture how beautiful they were, but I did my best, and hopefully, you will get an idea of how special your big day can be if you decide to make those garlands. They are really easy to make. 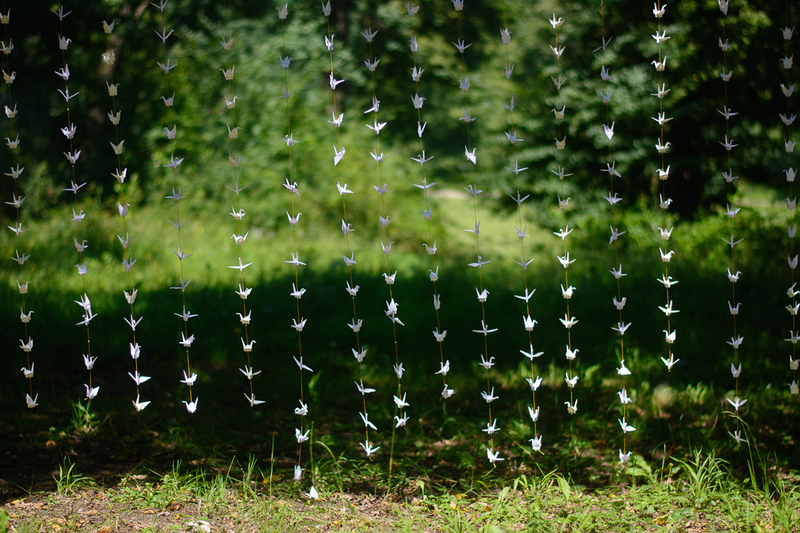 You just have to fold lots of cranes and pun them on a string. I use about 14 of them for one string and had 30 strings of them. I also used beads to secure the crane on the string. I used a needle in order to go through the paper in the middle of the model. And I also went two times through the bead so that it will stay in place, or I could slide it back in position when it would move. You don’t even need that many in order to get a nice effect, as you can distance the strings at about 10, 15 cm one from another. 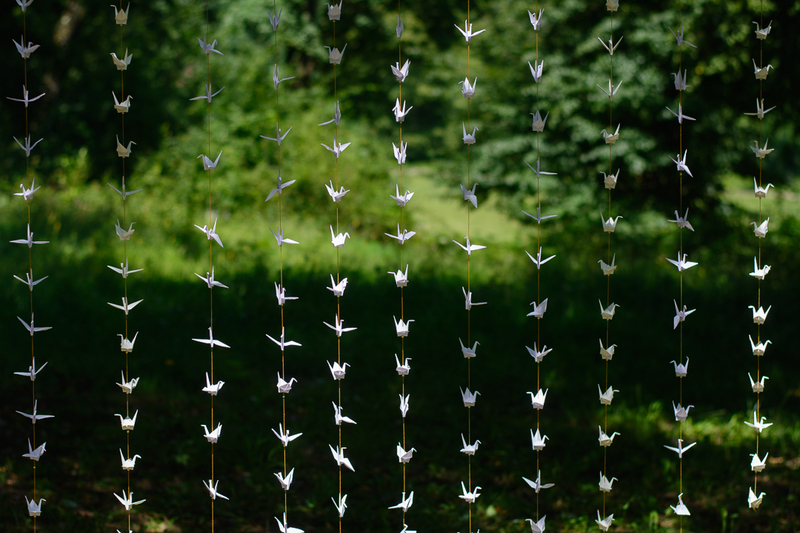 You can see how only 30 origami cranes strings create an original and spectacular wedding backdrop. You will look amazing photographed next to them. 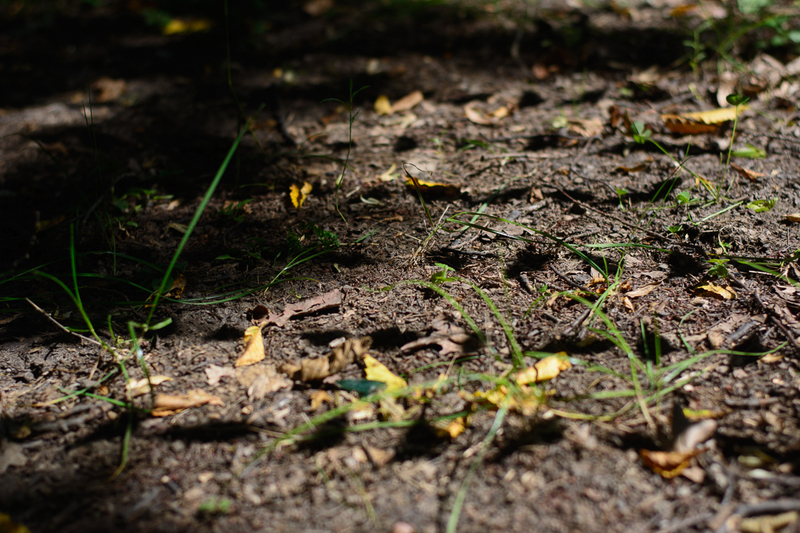 They also make some amazing shadows on the ground and look amazing in the photos. You can get some really creative photos with them if you play with the angles. Those are some great detail photos to be put on your wedding album, so a page could really tell the atmosphere, and joy of the party. 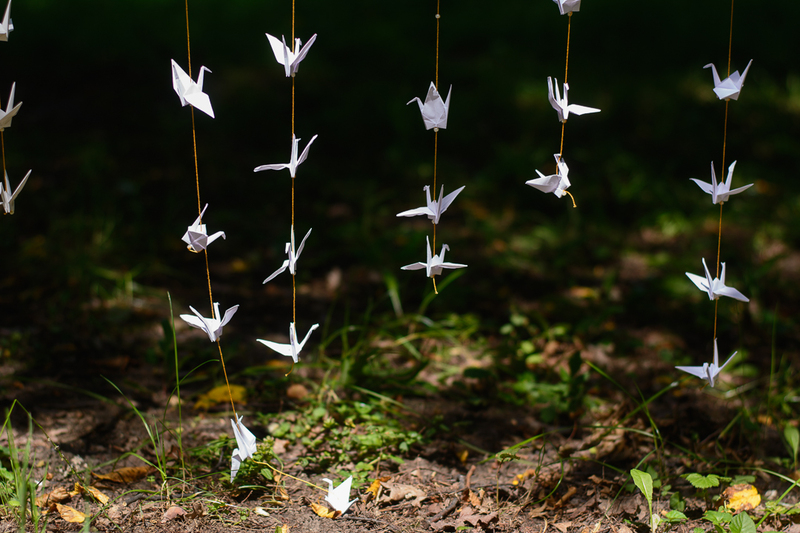 You can decide to fold the cranes yourself and so you will spend some quality time thinking of your special day, or make them with your future husband, or bond even further with your bride’s maids. 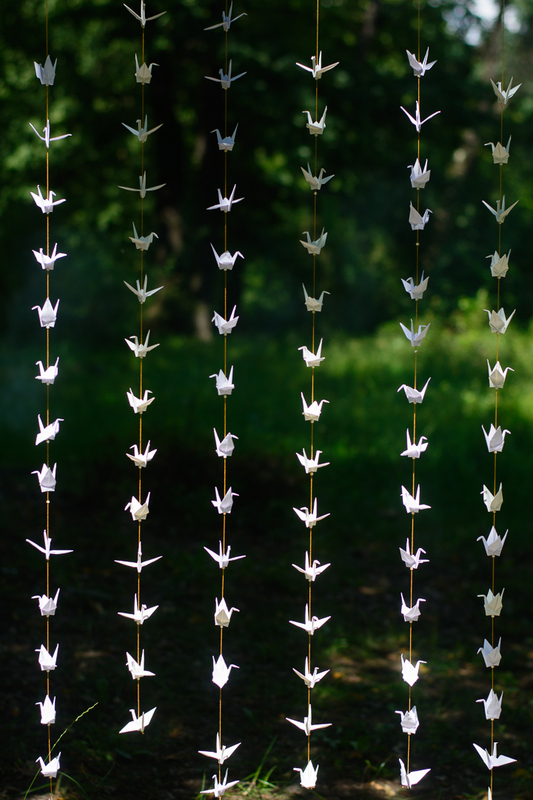 I had an amazing time folding each and every crane and I really had a great time photographing them as well and I hope you will too if you decide to make some. 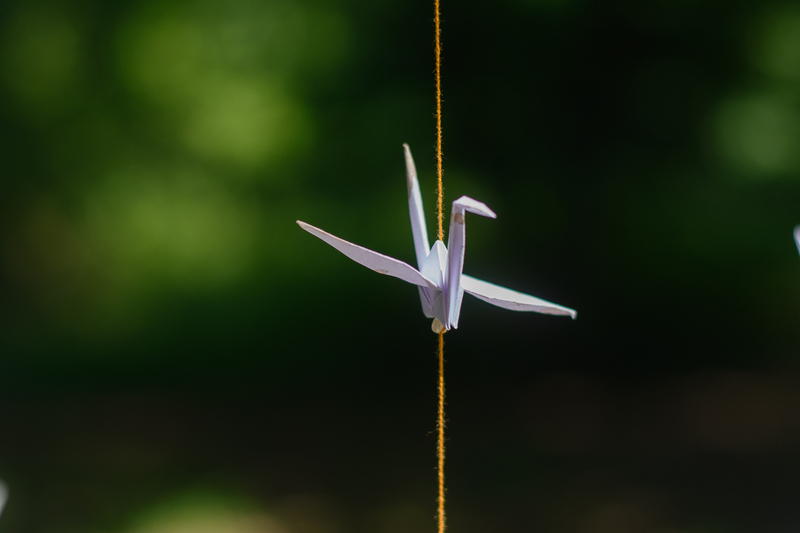 Here you can find a link to a video on how to make a crane. I do believe your special day will be more special like this. I know mine was. But of course, we don’t all have the time or patience, so I’m sure you can find them online as well, so you could buy them. I think on Etsy you will be lucky. I would love to see if you decided to fold them or even just use this idea on a special day. You can show me photos of them by tagging me on your Instagram my account is @paperfingercuts. You can see how my first month went here. You can also see the second month here. And I still haven’t made the whole models for the third month, so I’m really behind. Hope I will get back on track pretty soon. And by the way, if you wonder what happened with the cranes at the end of the day, it’s a sad story. It started raining, and we were on foot, so I did start to pack them back in the bag. The rain got heavier and I slipped on the dirt and the bag got really really wet, so I had to let them go. I like to believe that they started flying and went on a new adventure, but they actually end up in the recycling bin. 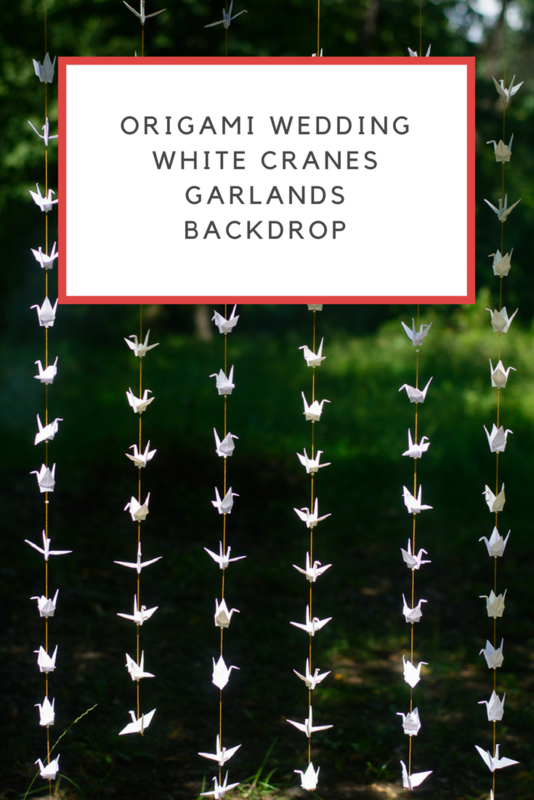 I do still have those amazing photos of a great wedding backdrop and the jar full of cranes. Congratulations for your wedding anniversary. I hope I will inspire a lot of people to use paper in order to create amazing event settings. Oh my goodness that is such a cute background. What a lovely idea to have as something different, I wouldn’t mind a chain of them to just have around the home. Thank you. I totally recommend you make some and put it in your house. They really make the place more special. Are my goodness this is such a pretty idea! Already married but I have a friend planning her wedding that might like this. Thank you. I hope she finds inspiration from my photos and goes for it. What a gorgeous idea for wedding decor! I would have never thought of that before! These are so pretty. They would be so pretty for a special occasion.